On one hand, wind industry representatives contended that setbacks and low frequency noise standards proposed would effectively bar most industrial-scale wind projects in our region. On the other hand, rural residents voiced fears that the ordinance did not go far enough to protect health and safety , as well as to preserve many of East County’s most scenic areas that fall within a “wind resources” map. 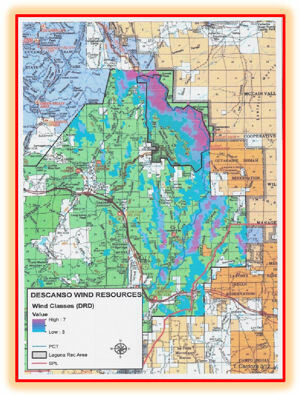 Among the most contentious areas is the “Descanso Wind Resources” area within Cleveland National Forest. The Board of Supervisors asked staff to develop a two-tiered framework to “simplify” standards and bring wind regulations into line with current wind turbine technologies including newer, larger turbines, a staffer explained. Currently the county has three wind use categories based on heights and other factors. Under the new proposed wind ordinance, there would be two categories. 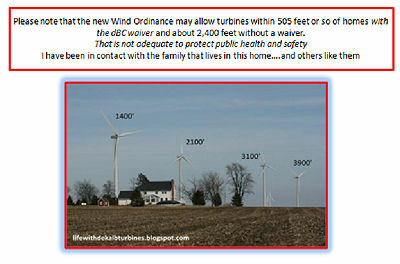 Turbines greater than 50 kilowatts would require major use permits to install, those under 50 KW would not. 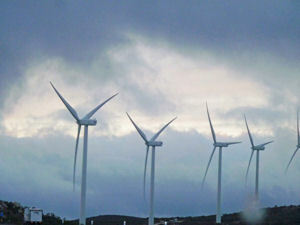 Smaller turbines would be prohibited on ridges and could have no power lines or lights. 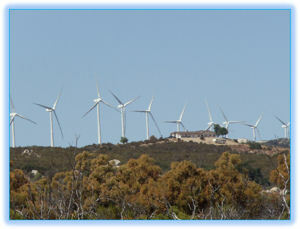 The wind resources in San Diego County are predominantly in East County, including mountain areas such as Julian and the Lagunas, numerous places within Cleveland National Forest, and rural communities such as Boulevard. “Low frequency noise can only be mitigated through distance,” the staffer said. 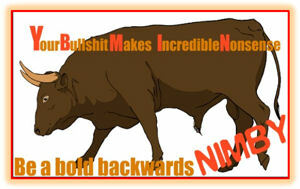 Staff proposed a new low-frequency noise standard based on “C-weighted” dBAs. If standards were found too restrictive, planners would waive the rule on a case by case basis, he added, or a developer could get permission from neighbors. A State Fish & Game official voiced concerns over impacts on birds and bats particularly if smaller turbines don’t go through review for biological impacts and warned that some small land owners might unknowingly violate state law. The Viejas band of Kumeyaay Indians sent a letter raising concerns over impacts on cultural resources, birds and health—as well as concerns that they were not notified of the hearing. Donna Tisdale, Chair of the planning group in Boulevard, where multiple industrial wind projects are proposed, presented a slideshow and testified emotionally that wind developers are playing “hardball” with misrepresentations including “actual fraud” to push projects through. Industry representatives at the hearing claimed that dirty electricity does not travel through the ground. 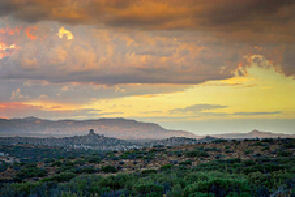 But Tisdale said in Italy, it has been tested and found to travel over six miles. It’s happened here, too. Samuel Milham, a retired physician epidemiologist and author of Dirty Electricity, submitted charts showing measurements he’s taken on the Manzanita Indian reservation in East County, near the Kumeyaay wind farm in Campo. 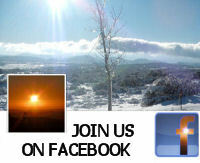 His findings revealed extremely high levels of ground voltage in the Manzanita tribal church and tribal headquarters. Dr. Milham says infrasound generated by turbines is also an issue, found to cause health problems as far as ¾ mile from blades. “My recommendation is that wind turbines should not be sited within ¾ mile of homes and that it would be prudent to delay wind farm construction until the utilities and the manufacturers can solve their electrical pollution problems,” he wrote in his comments. Tisdale testified that ground currents and infrasound could affect burrowing animals, birds and other wildlife. She also voiced concerns that turbines would increase fire insurance for area residents. 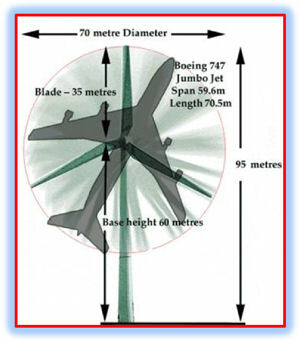 Slides presented by Tisdale illustrated the massive scale of modern turbines, which can be nearly 500 feet high, taller than the highest skyscraper in downtown San Diego, with blade spans the size of a commercial jetliner’s wingspan. At an Iberdrola wind facility in Canada, some neighbors had to abandon their farms and homes, Tisdale testified. Iberdrola proposes to build Tule Wind Farm in McCain Valley on Bureau of Land Management federal recreation lands. 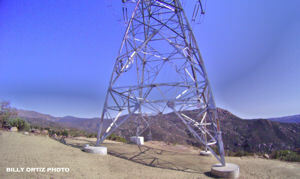 The area has already been impacted by Sunrise Powerlink, a factor Tisdale attributes to displacing wildlife. “Three mountain lions were killed on I-8 last month, a record, and CHP just had to chase bighorn sheep off the freeway,” she noted. Tisdale also pleaded with planners not to gut Boulevard’s community plan in order to facilitate development of industrial-scale wind projects. (Conversely, the commission’s proposal called for changes to preserve views and prevent large-scale turbines in Borrego Springs.) 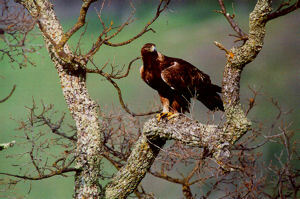 She called for a moratorium on turbines to protect residents and wildlife. Harley McDonald from Iberdrola testified that the company seeks to “help supply our renewable energy needs” and cited a need for more power in our region with San Onofre now offline, in order to prevent blackouts. She said the proposed ordinance would amount to a “de facto ban” on large-scale wind projects. Iberdrola currently has 12,000 MW of wind installations in 23 countries and claims to be the largest renewable energy supplier in the world. Another Iberdrola representative , Jeffrey Durocher, objected to the low-frequency sound standard proposed, adding that “Our project in East County has baseline conditions without turbines that exceed the standards.” He added that it’s unrealistic to expect companies to make big financial investments based on the hope of getting a waiver or permission from neighbors. A spokesman for Invenergy, another wind company, said concerns over turbines focus on “annoyance” not health and safety. (A planning commission staffer earlier told commissioners that health risks were not considered due to insufficient data, despite existence of peer-reviewed literature documenting clusters of similar symptoms among people living near turbines, such as sleeplessness, headaches, heart palpitations and ringing in the ears.) Invenergy’s spokesman called wind farms a “good fit” with rural lifestyles due to economic development. Enel, which wants to build a wind facility in Jewel Valley on 3,600 acres owned by the Lansing family, said only 135 of those acres could be utilized for wind under the proposed ordinance, absent a waiver. In addition, she said 505 foot setbacks proposed by the County are inadequate—showing images of towering turbines dominating homes even from much further distances. Tisdale says she has spoken with residents in other areas who complain of noise and health problems while living much farther away from turbines than the County proposal would require. Holly Smithson with CleanTech San Diego argued against the low-frequency noise standard, which she claimed would be the most restrictive wind ordinance in California. Laurie Baker, a Santee resident who enjoys hiking in the backcountry, said she supports a “no project” alternative and worries about habitat fragmentation. ECM editor Miriam Raftery raised concerns over setbacks, health and safety issues, impacts on wildlife and views and urged that the cumulative impact of multiple large projects be considered. Some on the commission seemed inclined to do just that. He also suggested that the County should consider imposing stringent sound standards. “I’d even like to make the threshold tougher, to what will be built tomorrow,” he said, indicating he believed the industry would response with turbines that would be quieter and generate less low-frequency sound. “When we decided autos had to get 30-40 mph, it’s amazing how fast that developed,” he remarked. Beck also worried about infrastructure impacts, noting the damage done by Sunrise Powerlink. “Drive out there and you can see it,” he said of the large towers. He wants to see power lines undergrounded, but notes that granite-strewn terrain could be a constraint. He also voiced support for a field trip to see the areas that would be impacted. Commissioner David Pallinger said there are “many, many issues from many groups” and said consideration of how to resolve issues at the “county and national” levels must be determined. Commissioner Leon Brooks said he shared his colleagues concerns and also voiced support for a workshop and field trips. Commissioner Riess recalled an incident when a Russian submarine leaked secrets through sounds intercepted and said the Soviets promptly eliminated all leaks. “Can’t we get the C-levels down?” he asked. The Commission will likely have further discussion on the wind ordinance issues at its next meeting on April 27, with staff provided additional time to address concerns raised. Public testimony will be heard again at a future date not yet determined. Meanwhile a workshop and tour will be organized by staff. With wind subsidies expiring at year’s end, the wind developers face a steep obstacle to future projects in the U.S.; some have also experienced plummeting stock prices in part due to market uncertainties. Now, those uncertainties also include the future of wind regulations in San Diego. The commissioner's doubts are a good sign. Let's hope that common sense continues to prevail and that they remain open to the full truth about “wind farms,” which consists entirely of good reasons to not build them. “Prompted by various federal and state government tax incentives plus market-obliterating "renewable mandates," hundreds of square miles of mountain and prairie have been covered with 45-story windmills that look like the archaeological remnants of a previous race of 80-foot giants. These "wind farms" generally produce electricity that is essentially useless. When the wind blows, windmills can force other forms of generation out of the market because they are free of fuel costs. But those other forms of generation have to be kept running just in case the wind dies down. Last year when temperatures rose to 110 degrees in Texas, that state's 7 percent "wind capacity" proved absolutely useless in the heat-induced doldrums. And wind "farms," it should be noted, always talk in terms of "capacity" rather than output. That's because they only operate about 30 percent of the time. Nobody has yet invented a way to store commercial quantities of electricity and it may be impossible without building facilities of equally gargantuan dimensions -- say an entire city block of rechargeable batteries. Without any means of storage, wind power is essentially a nuisance. Then there is solar electricity, which, in order to access, California is now planning to cover dozens of square miles of pristine desert (yes, there is already environmental opposition) in order to prove the world can run on sunshine. Solar energy is a bit more concentrated than wind so that it only takes about five square miles of highly polished collectors to produce 100 megawatts -- when the sun shines. In the desert environment, these solar panels will require constant cleaning and polishing to keep them from getting covered with dust and therefore becoming dysfunctional. It's a labor-intensive task that will require lots of water coming from who-knows-where.